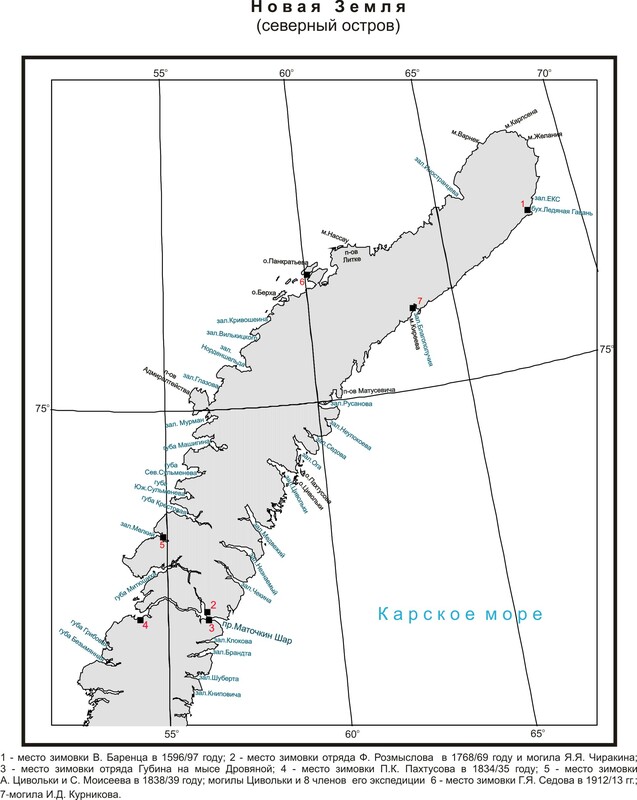 Barents embarked on three voyages in search of the Northeast Passage. A group of wealthy Dutch merchants intended to establish trade relations with China across the Ob River. Prior to this, the British showed such aspirations. In 1594, four ships were equipped under the general command of Cornelis Nye. As part of this squadron, departing from Amsterdam, two ships formed an independent detachment, which was headed by Barents. He was instructed to go, bending around the New Earth from the north. 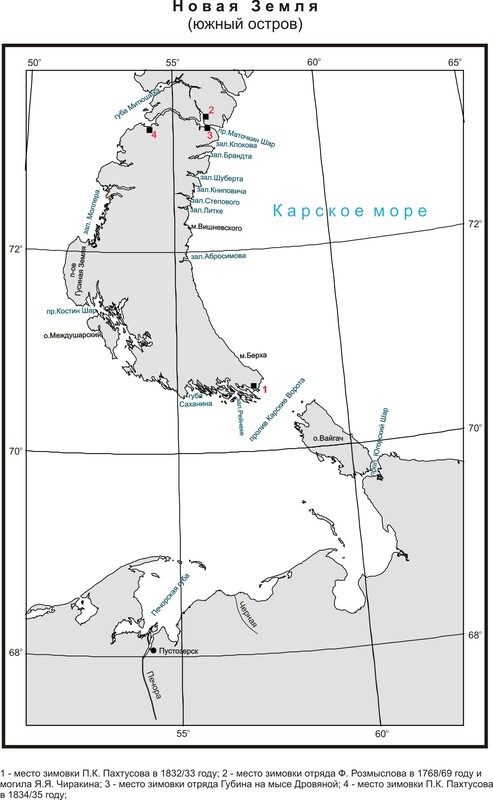 Already in early July, the ships reached Novaya Zemlya at a latitude of 73º25′ N. After going north, the sailors landed on the shore, finding there traces of the Russian people. Directing ships along the west coast to the northern tip of Novaya Zemlya , Barents discovered the Admiralty Islands, William and the Crusades. Moving on, the brave mariners passed the headland of Nassau, which was very prominent at sea, and made their way through the ice to Cape of Consolation and with the greatest difficulties to the Oranian Islands. Then the path was closed, and the Dutch were forced to turn back. On the way back, Barents mapped the entire area he examined. 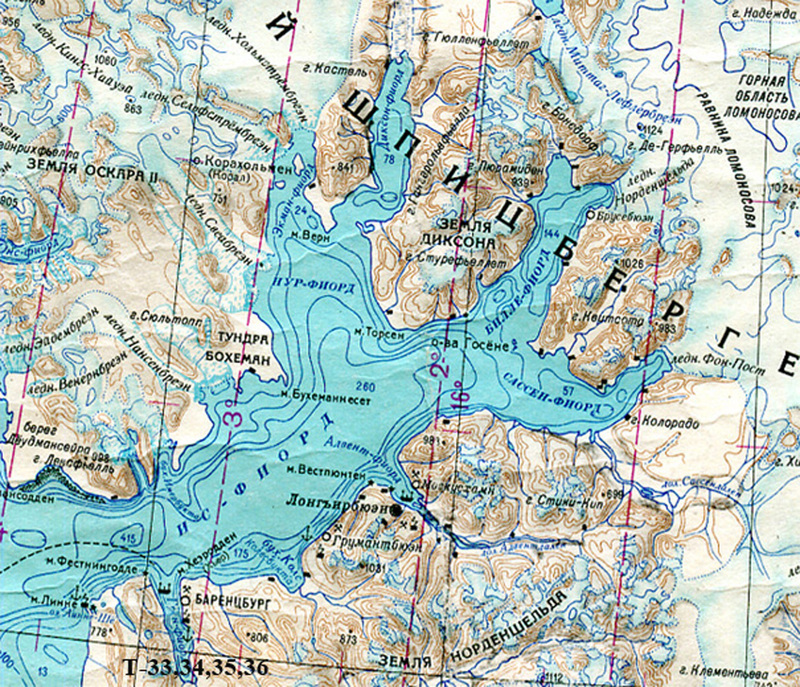 The ships of Nai were able to pass through the Strait of Yugorsky Shar into the Baydaratskaya Bay, which they took as the mouth of the Ob. The news of the opening of the route to China caused great enthusiasm in Holland, and in 1595 seven ships were already equipped, and the government also made its contribution. This time the expedition was unsuccessful. Because of the heavy ice, the ships stopped at the exit from the Ugra Ball. 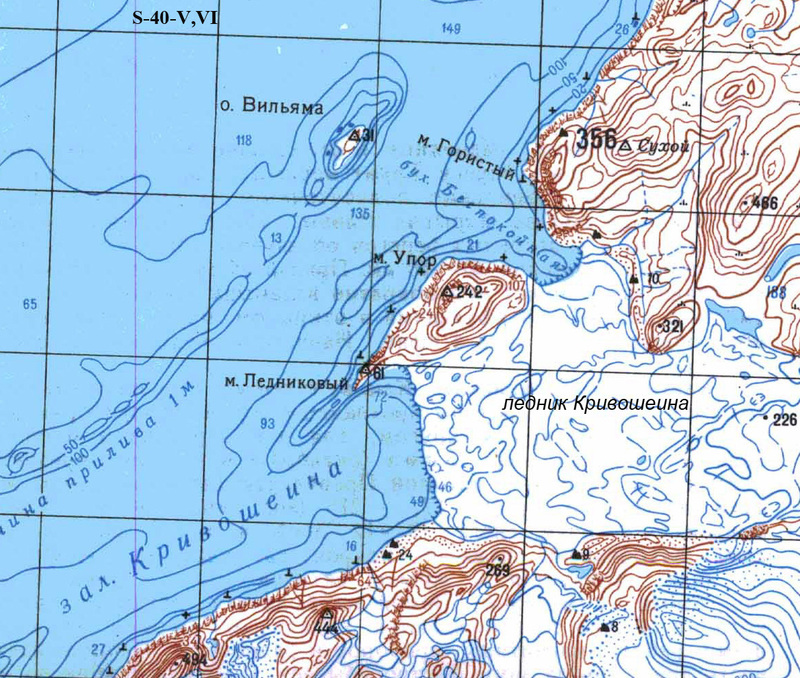 At the council that Nay convened, the captains spoke in favor of returning home, and Barents, who suggested moving around the northern tip of Novaya Zemlya, was forced to agree. The failure had a sobering effect on the Dutch. The government refused to subsidize subsequent expeditions; nevertheless, the funds for sending two ships in 1596 were found. The courage and determination of Barents scared the owners of the ships, and he was assigned the role of navigator on the Gemskerk ship. However, the authority and influence of the Barents actually made him the leader. The ships left Amsterdam on May 10, reached the shores of Norway and turned straight north. 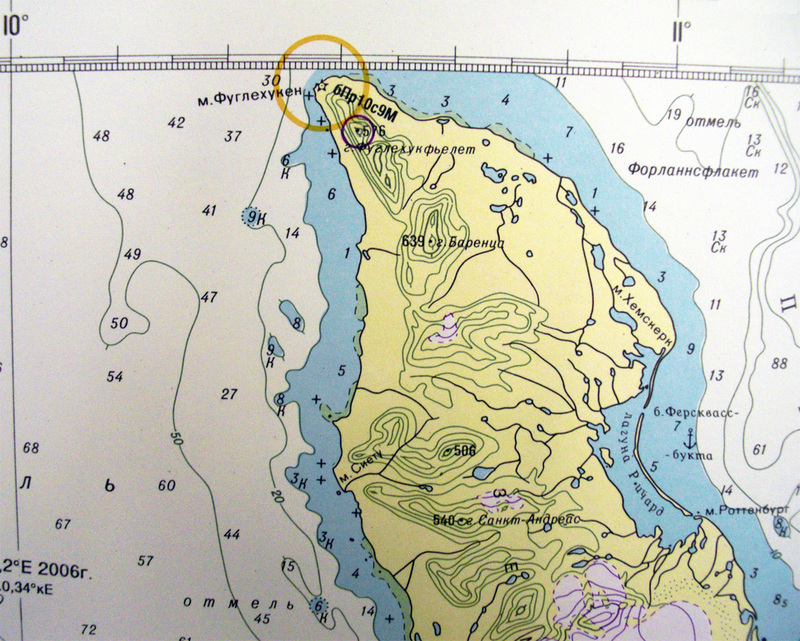 At the latitude of 74° 30′N, they discovered an island called Bear. Continuing to the north, on June 19 they approached the vast land unknown to them. It was Spitsbergen, regularly visited by Russian industrialists. Having met heavy ice north of Svalbard, they returned to the Bear. At the council, opinions on the future route diverged. 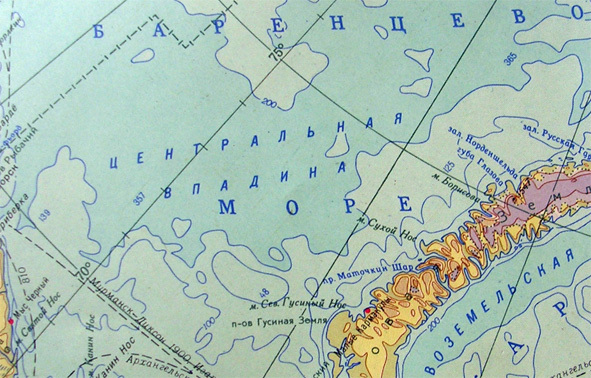 At the insistence of Barents, his ship headed for the northern end of Novaya Zemlya. 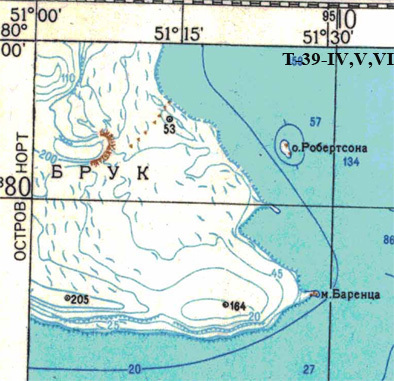 Overcoming heavy ice, reached the Oran Islands, and then finally circled the Cape of Desire and headed south-east to the mouth of the Ob River. But the voyage was short. Two days later, they were forced to turn to Novaya Zemlya and took refuge in the bay, which they called Ice Harbor. Here, on the northeast coast, the expedition, consisting of 17 people, was forced to winter. The ship was seriously damaged, and the wintering men moved to the shore, hastily erecting a house from a fin. This wintering, one of the first in the Arctic, was very difficult. Many had scurvy, two died, all suffered from intolerable cold. The mention of the throes of cold is constantly found in the diary of the expedition member Gerrit De Fehr: “The weather is severe, and a cold wind blows from the east. We look at each other with pity, fearing that we will die if the frost is even stronger. For whatever great fire we lay, we cannot warm ourselves". Or: “The house is terrible cold. You stand near the fire so close to it that you almost burn the front parts of your legs, and your back freezes and becomes covered with frost”. In May, the sea cleared of ice, and the Dutch began to prepare for the return. The damaged vessel was not suitable for navigation. In mid-June, went home in boats. By this time, Barents was already seriously ill. The approach of death did not deprive him of courage; until the last moment he gave instructions to the crew regarding the upcoming voyage. He could no longer walk, and he was carried into the boat in his arms. Barents died while sailing on June 20, 1597 near the northern tip of Novaya Zemlya and was buried at sea. Even on the day of his death, he carefully studied the map he had drawn up, comparing with the banks sailing past. In the afternoon, he ordered to lift himself in his arms in order to get a better look at Cape Icy, then he asked for a drink and died. “The death of Barents”, wrote Gerrit de Fer, “caused us considerable grief, for he was the main leader and indispensable navigator. But we could not resist the will of God, and this thought was a little comforting for us". His comrades continued to move south and on 28 June in the Stroganov Bay met Russian industrialists, who took an active part in their fate. Having reached the mainland, the Dutch learned that there was a foreign ship in Kohl. This turned out to be the second ship of their expedition, which, returning home from last year’s voyage, was making a new expedition. The Barents report on the expedition, left in a hut at the wintering site, was only found in 1871 by the Norwegian captain E. Carlsen . Despite the past 274 years, the hut itself and its interior were perfectly preserved and fully corresponded to the description made by Gerrit De Fer. Sea, previously Russian, Murmansk, Moscow, Studenoe. The modern name is first found on the map of A. Peterman in 1853. 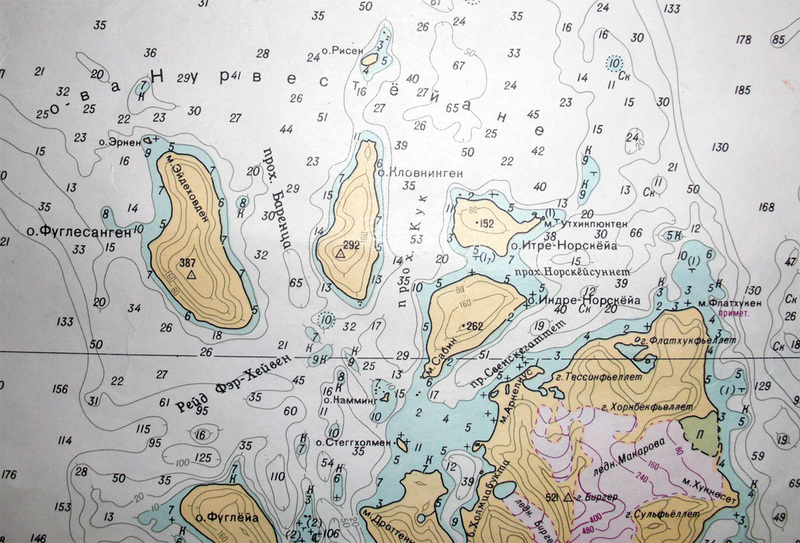 Islands off the west coast of Novaya Zemlya to the north of Cape Litke. Named F.P. Litke in 1823. 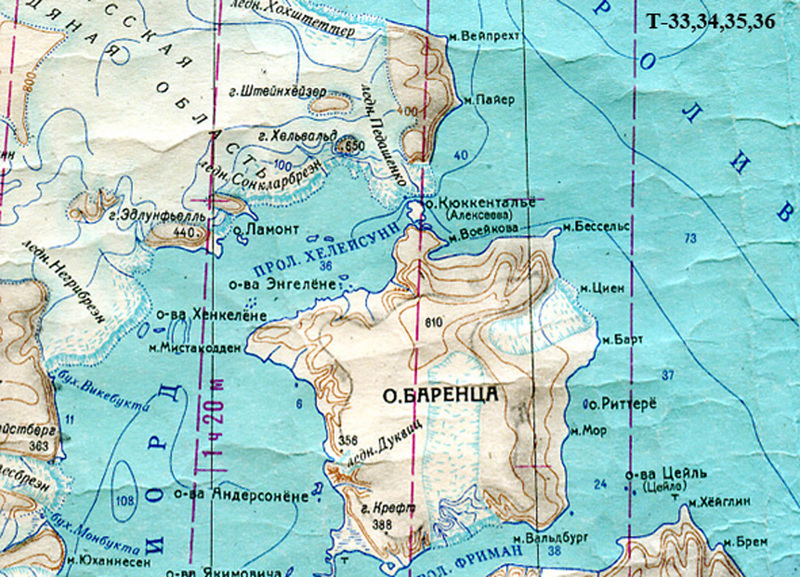 The island (William) off the west coast of the northern island of Novaya Zemlya south of the Gorbovye Islands. Named in 1594 by the Barents expedition on behalf of the chief. An island in the southeastern part of the Svalbard archipelago. Cape in the southeast of Northbrook Island in the archipelago of Franz Josef Land. Named in September 1879 the commander of the Dutch research vessel "Willem Barents". The mountain in the north of the island is Prince Charles Land in the Svalbard archipelago. The village (Barentsburg) on the island of Western Spitsbergen. The name is given by the name of the Dutch mine, bought in 1932 by the Soviet government from the Netherlands. Strait (passage Barents) between the islands Fuglesangen and Klovningen north-west of the island of West Spitsbergen.